Georg Nikolaus von Nissen, biographer of Wolfgang Amadeus Mozart, reports a meeting on the composer with a harp player in Prague named Josef Häussler; obviously Mozart was very impressed by his playing. So he composed a little "theme" for him and asked Häussler to try some improvisations on this melody. This the Bohemian harper did so well that Mozart gave him some generous presents. This happened in 1787. We also know, that Häussler played on a small Bohemian harp and that he was probably unable to read music - like so many of the itinerant Bohemian harpers. For about 400 years the little harp was a widespread instrument not only in Bohemia but also in the neighbouring areas of Southern and Middle Germany. In The 16th century many skilled harpers earned their living as court musicians; harps were built in many places like Nürnberg, Jena or Nordhausen. The first collection of tunes specially written for the harp, however, dates quite late: a Leipzig manuscript from 1719 is entitled "Musicalische Rüstkammer auff der Harffe" and contains almost 100 Baroque dances in a style influenced by French music. The repertoire of the harpers before that time remains unknown; probably they played their own versions of those melodies that survived in lute or organ tabulatures. Around the end of the 18th century the pedal harp became more and more important in art music. 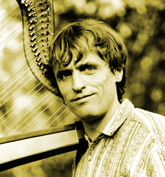 In folk music, however, the hook harp was still used for a very long time. At the end of the 19th century reports mention that many young female harpers from Bohemia travelled around the country and earned their living by music. Until around 1950 this tradition survived in some parts of Germany, especially near the Harz mountains. 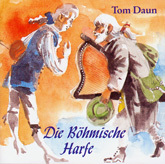 The single-action pedal harp of Tyrol, still played in Bavaria and, of course, Austria is closely related to the Bohemian harp and it is the only traditional harp still in use in German speaking countries. Rundtanz (track 1) has been composed by Hans Judenkünig (1450 - 1526) and released 1526 in his tutor for flute players "Ain schone kunstlich Unterweisung ... zu lernen auff der Lautten und Geygen". Hühner G’schrei (track 2) is a musical imitation of the sounds in a hen-court; this melody has been found in an anonymous lute manuscript. Hans Neusidler (1508 - 1563) wrote down the Gassenhawer (track 3); which means "street song". Newsidler also composed Wascha mesa / Hupff auff (track 4), supposedly a variation of a popular gypsy-dance melody. His son Melchior Neusidler (1531 - 1590) is the author of Der Fuggerin Tanz (track 5) which he wrote for the wife of his patron, a member of the wealthy Fugger family from Augsburg, one of the biggest international bank- and trade dynasties of that time. Valentin Haussmann (1567 - 1614) was a composer, music publisher and poet who moved around everywhere in Germany. His Polnische Tänze (tracks 6, 7, 8) were influenced by Polish melodies that he learnt on his travels. As a young man Esaias Reusner (1636 - 1679) also lived in Poland, learning to play the flute from a French musician. Later, he was to become Germany’s most polished lunenist of the 17th century. The three pieces Aria I, Gigue and Aria II (tracks 9, 10, 11) were taken from his Suite in g-minor, released in Berlin in the year 1676. "Musikalische Rüstkammer auff der Harffe" is the first German collection of pieces specially written for the harp, printed in Leipzig 1719. Menuet and Bourree (tracks 12, 13), both in d-minor, are noted on opposite pages in the original manuscript. The Suite in C (tracks 14, 15, 16, 17, 18) is a new combination. Mozarts Mazurka (track 19) is based on a melody published by Anton Shimon in Prague in 1848. He Claims that this is the original melody that Mozart had composed for Josef Häussler, the Prague harper, sixty years earlier. A collection from Southern Egerland, in 1825 released as "Rittersberg Sammlung", contains many tunes belonging to the local repertoire. Apart from harps, bagpipes were used a lot in the music of this area. Egerländischer Landla (track 20) and Walzer / Zwiefacher (track 21) were taken from that collection. Finally two harp dances from Vienna, found in a manuscript on Schloss Grafenegg near Krems in Austria. Die Lichtenthaler / Wiener Früchterln (track 22) were written down around 1852. Thus, the musical circle closes where he began with Hans Judenkünig: in the town of Vienna. All tracks of this album recorded in February 1997 at Protestant Church Honrad in Germany. Audio-Engineers: Martin Frobeen and Götz Bürki.